Now there are more empty nails on the wall than art. About two-thirds of the individual pieces for the 2011 Project have been distributed and about 135 still remain. If you would like to be a curator and receive a piece from the 2011 Project, see below. From the start, the idea has been that individuals will not own pieces of the 2011 Project, but rather will curate the pieces for me. Eventually, at some point in the future, perhaps 10 years, perhaps longer, I may want to bring the pieces back for a showing. 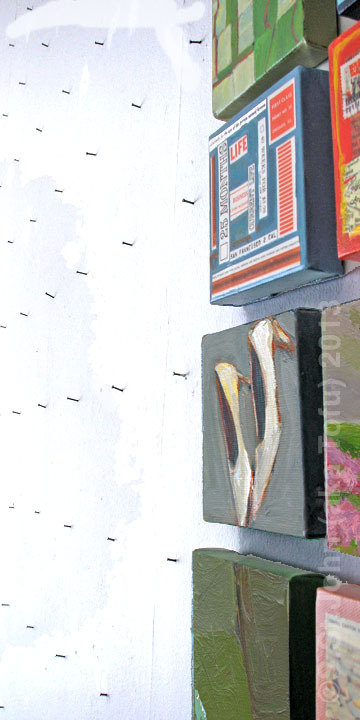 I think of each, single 4"x4" piece as an art "time capsule." After future showings, the plan will be to return the pieces for further curation. When you receive a piece of art, it will come with a letter instruction with details about displaying and caring for the art, what is permissible in terms of sharing images of the art and also instructions regarding keep in contact. If you have any questions regarding what is involved with being a curator for the 2011 Project please email me. The remaining, available pieces can be found on the linked pages below. They are organized chronologically by season. If you wish to be the curator for a piece(s) please email me first to verify that your choices are still available. You can make payments via paypal, or if you are local, pay me in person.